The Bangladesh Nationalist Party (BNP) and Bangladesh Awami League (AL) have unveiled their manifestos for December 29 Sangsad election. The AL has termed its manifesto as ‘a charter for change’, while the BNP has initiated the document with ‘save the country, save the people’ slogan. 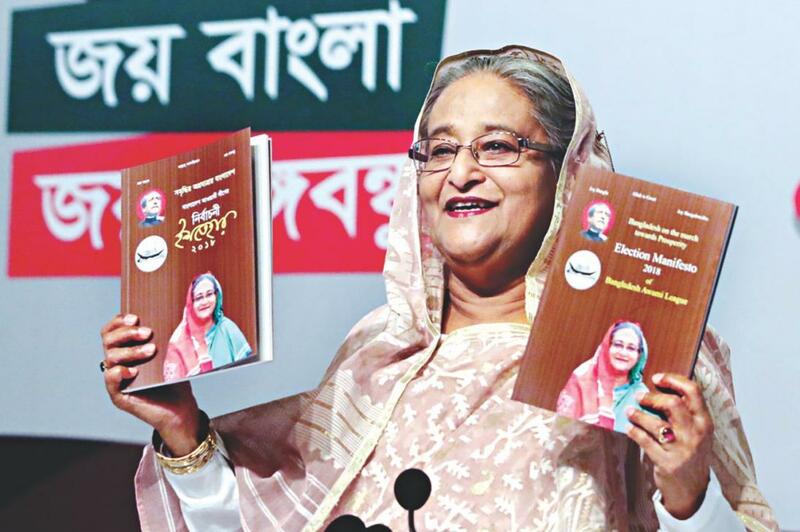 While the BNP manifesto is a 36-point charter of promises, the AL manifesto contains 23 broad pledges placed against the backdrop of a vision for Bangladesh by the year 2021. The AL manifesto presents five priority programmes and puts the remaining pledges under the category of other important programmes. The BNP manifesto puts a long list of pledges. However, the first three programmes of both the BNP and the AL are more or less identical: a) commodity price hike, b) suppression of corruption, and c) power and energy. Two other priority programmes of the AL are: elimination of poverty and inequality and establishment of good governance while two of the first five programmes in the BNP list are: establishment of law and order and suppression of terror; economic development, industry and trade. A close look would reveal that in their economic programmes the two parties do not differ much. However, their approaches are different. The BNP depicts the two years of caretaker government under emergency as a bad period and promises to enforce the UN Declaration of Human Rights and repeal the Special Powers Act of 1974. It also promises suitable amendment to the provisions relating to caretaker government for ensuring that elections are held without fail after every five years. Under its programme of good governance AL pledges to ban the use of religion and communalism in politics. The BNP has pledged to publicise Bangladesh’s image as a non-communal, liberal, tolerant and peaceful society and resist the propaganda depicting the country as fundamentalist, aggressive, corrupt and violence-prone. Both the parties have promised activation of local government institutions at district, upazila and rural levels. They have also promised self-sufficiency in food grains production and all support to farmers to help achieve the goal. For this subsidies to agriculture have been promised by both. On the vital question of sharing Transboundary river water the AL manifesto calls for regional cooperation and pledges the construction of the proposed Ganges Barrage to meet the fresh water demand of the South West region and the Sunderbans. The BNP manifesto calls for a fair share of water of the Ganges and other shared rivers. Bangladesh Jamaat-e-Islami (BJI) also announced its election manifesto with a 23-point agenda giving top priority to the education sector. The BJI will make efforts to free the educational campuses from the teachers’ politics to create a congenial atmosphere in the education sector, said Jamaat Ameer Maulana Motiur Rahman Nizami while announcing his party’s election manifesto at a press conference in Dhaka. He said the election manifesto has been prepared with a view to restoring democratic system and leading the country toward prosperity. Maulana Nizami said his party would take part in the forthcoming elections as partner of the BNP-led four-party alliance and try to implement their election pledges if the alliance voted to power. Referring to the election agenda, he said the BJI would enhance salaries and allowances of the government employees to establish an administration which could ensure good governance and free the nation from corruption. The 25-page election manifesto bears the party’s election symbol balance. The Jamaat Ameer paid his rich tributes to the martyred freedom fighters, who laid down lives for the liberation of Bangladesh during the nine-month bloody war. The election agenda also include formulation of a strong national defence policy and strengthening the armed forces, taking an all-out programme for freeing the society from terrorism and corruption, providing necessary subsidies to the farmers and farms, strengthening the TCB to make the availability of agri-inputs easier and check the price spirals. BNP has formed a grand alliance (Jote) with Jamaat-e-Islami and two other parties while AL has formed another grand alliance (Mahajote) along with Jatiya Party (JP) of ex-president H.M. Ershad and four left-leaning parties. According to the agreement reached between the parties BNP will contest 260 seats, while BJI to get 34 seats. Jamaat will also contest four seats side by side BNP and whoever wins will join the Jote. Six other seats were also distributed among two other parties. Meanwhile in the AL-led Mahajote, AL will contest 245 seats, while JP 49 seats, nine seats were allocated to secular left-oriented parties. The election for one seat remains suspended due to the death of a candidate.